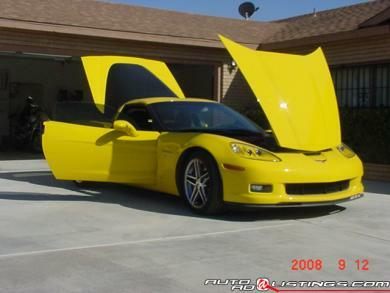 the item listed here is a 07 corvette. it is a v8. practically brand new. only 1300 miles on it. been sitting in the garage most of life. never raced,abused. this car has been babied. adult owner. this is gm's fastest production car for 2007. 505 horsepower followed by a 6 speed manual transmission. no body damage whatsoever. completely immaculate showroom floor condition. factory bose stereo system with 2 10" subs 2 amps, custom box, every option/upgrade possible in this car. this car is fully loaded!!!!!!!!!!!!!!! car still has full transferrable warranty. yellow exterior, black interior leather. navigational system. i repeat, this car is fully loaded. any questions, comments, or concerns, please contact MATT @ 702 340 9022. asking price is 62,500. my offer stands still.